The social historian Huu Ngoc once described it as Vietnam’s contribution to human happiness, and the novelist Duong Thu Huong wrote of strolling the streets of Hanoi just to inhale its perfume. 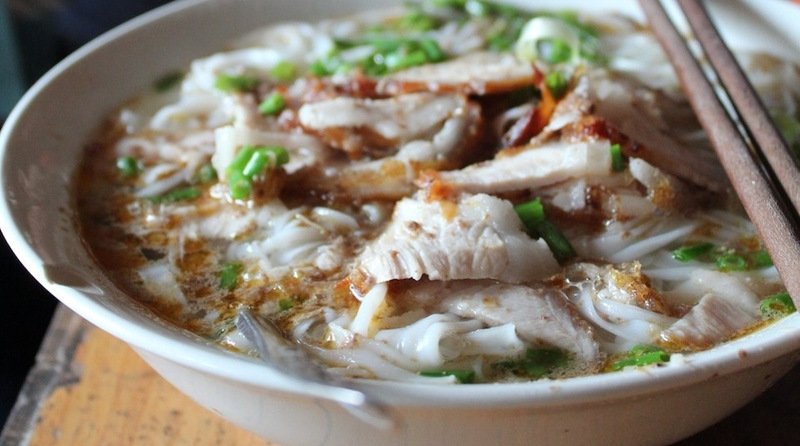 In Vietnam, pho is far more than just a soup. It is the meal of the people and holds a soulful place in the country’s cultural identity. Pronounced ‘fuh’, as in ‘pot-au-feu’, it is thought that pho surfaced during the French occupation of Hanoi in the mid-1880s. Up until that point, cows and buffalo were prized beasts of burden and the Vietnamese ate very little red meat. But the French’s beefy appetite changed things and red meat slowly started making its way into the city’s markets and kitchens. As bifteks were carved off the bones to satisfy the upper classes’ newfound taste buds, cooks started simmering the leftover oxtail and shinbones to create a clear consommé. Influenced by the cooking style of the French, they added charred onions to this nourishing broth and served it with slices of raw and cooked beef. Yet the French were not the only ones to make their mark. The introduction of ingredients such as noodles, ginger and anise came from Vietnam’s neighbors in the north, and pho became the country’s answer to China’s lo mein. Fusing together these foreign influences, the Vietnamese added their own nuoc nam fish sauce and created something wholly unique. 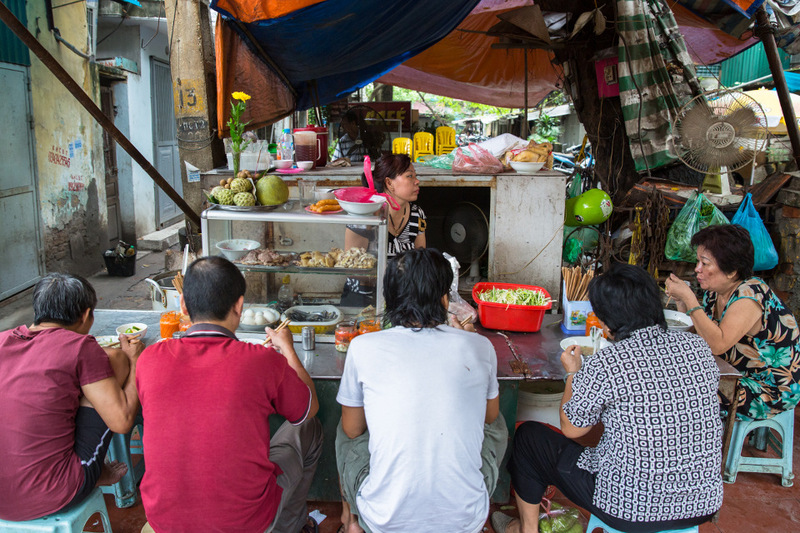 Today, pho stalls spill out across the sidewalk of nearly every street in Hanoi. Unlike their freewheeling counterparts in Saigon, who embellish their pho with everything from bean sprouts to cilantro, basil, lime and hoisin sauce, the northern pho purists of Hanoi pride themselves on crafting an unadulterated and well-balanced bowl. Today you can find everything from corned beef (chin) and raw beef (tai) to chicken breast, chicken skin and eggs in your pho. With so many options, and so many stalls to tempt you, it can be hard to know where to turn for the best pho in Hanoi. In order to find the best in the city, ProjectBly turned to the experts at Hanoi Street Food Tours. Run by Australian food blogger Mark Lowerson and Vietnamese tour guide Van Cong Tu, Hanoi Street Food Tours specializes in taking traveling foodies around the city’s eclectic wet markets and street-side eats. They are the kind of guides that take you off the beaten path, introducing tastes and cultural nuances that most of us might not discover on our own. When we asked them to recommend their top pho stalls in the city, we thought they might have one or two favorites. Instead they shared their incredibly well-researched list of their top twenty spots, rated on everything from the broth’s clarity, to the generosity of the meat serving and the variety of condiments on offer. If you are inspired to take your own food adventure in Hanoi, and see if pho is indeed a bowl of happiness, you can book a tour with Tu and Mark by emailing them at tuvancong2003@yahoo.com and lowiemark@yahoo.com.au.